We offer a full range of tours from easy to challenging, and customized tours to meet your needs. * Durations provided for each tour based on stops for narration, photo opportunities and/or scheduled breaks as required per tour. * NOTE: Transportation to starting locations is not included. Please see our "check list" link for things you should bring with you on a tour. We offer an unmatched combination of tours where guests experience a connection to nature (and sustainability of our environment) with specifically designed Workshops for creating greater Corporate Consciousness for your business and employees. Review our tours and explore our Unbeaten Yoga and Corporate Workshops Page to learn more about our UNBEATEN APPROACH to Corporate Work Retreats! One-of-a-Kind and uniquely delivered Architectural & Cultural focuses that would otherwise go undiscovered. Carefully selected Yoga Options: From Breath Walks, Meditation, Custom Sessions, Sound therapy & More. Contact us for details. Click on the Tour Name for Pricing and Further Details! Thank you! All Tours are private (no mixed groups) and require a minimum of 2 people or more. "L-O-V-E-D being guided by Margaret at Stornetta. Breath-taking scenery and secret nooks. We thoroughly enJOYed this hike. Margaret is so knowledgeable, FUN, and shares her love of nature. Margaret and Phil were AWESOME! Can't wait to do another hike together! " Spectacular coastal scenery is the backdrop for exploring the hidden gems of this recently dedicated unit of the California Coastal National Monument System. Tour includes Geology, Oceanography, Birding, Local History & more! A real treat of a tour that provides a fantastic overview of the region and it's location allows for a wonderful day full of activities with the iconic Point Arena Lighthouse, restaurants and shops near by. VERY POPULAR & great for work retreats! This tour is about so much more than the architectural and landscape philosophies of The world renowned Sea Ranch! Learn how interconnected these philosophies are with the region as we weave our knowledge of local history, geology and marine & wildlife habitats into our narrative to provide guests an interesting and engaging understanding of this one-of-kind place. A GREAT KICK-OFF activity for your WORK RETREAT WEEK! In the business world Corporation = Cooperation and our Sea Ranch Architectural, Landscape & Nature Tour equips the corporate tool box with greater perspective on problem solving, responding to conditions in the workplace, supporting Intention and developing a TripTic for Success ---- a great way to kick off a work retreat week! tree bathing on a new Unbeaten level! A phenomenal mix of redwood forest and coastal engagement. A beautiful time experiencing the variety that the area has to offer. She kindly hosted my wife and I for a very personalized experience. 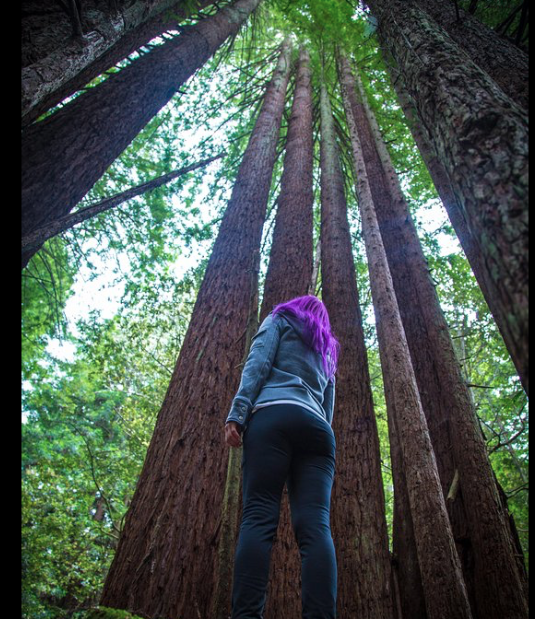 quote and photo below by James F.
Guests are mindfully guided through the incredible redwood trails that eventually lead to the coast where they discover and learn how all they see, touch and experience is interrelated, interconnected and ONE. This Unbeaten Tour takes Tree Bathing to another level because we engage guests into the deep dynamics of the redwoods and how those dynamics are born from our oceans all while connecting guests to the beauty, peace and magnificence that are our COAST REDWOODS! WOW! NOTE: Tours can be modified to focus solely on the redwoods. The distance is less but we take more time with mindfulness and interaction in the forest. Ann & Joe , Denver, CO.
A fantastic tour for photography and learning about our local wild flowers, geology, regional history and marine ecology. In addition, the wildflowers of this region provides one of the most diverse and prolific collection of wildflowers IN THE COUNTRY! There is plenty to discover on this tour! Don't miss out. Wildflowers are best in Springtime through June. Our Unbeaten 2hr Tide-Pooling tours offers a combination coastal hike with great tide-pooling time. Guests receive a hearty background of educational and regional information connecting them to the Pacific Ocean through the Landscape. The last half of the tour is spent discovering treasures of our tide pools such as sea anemones, starfish, chitons, crabs, sculpins, nudi branches, hermit crabs, mussels and more! Tours based on availability, tides and conditions. Wear Close-Toed Shoes with good traction, Wear sunscreen if needed, Bring a camera or sketchbook if you wish. Our tours are no-touch, no take - we observe and tread carefully. It was perfect! Beautiful and scenic! Informative, fantastic and relaxingly therapeutic! - Team Anchor Distilling!